Formula 1's governing body has published its report into the accident during this year's Japanese Grand Prix that left Jules Bianchi with severe head injuries. It is packed with technical explanations and is careful to avoid apportioning blame to any one party. So what does the report mean? Was Bianchi going too fast? This will create all the headlines, but it was self-evident long before the report of the FIA's accident panel concluded that Bianchi "did not slow sufficiently to avoid losing control". The section of track at which he crashed was under double waved yellow flags - the most extreme form of caution signal before a safety car is deployed. This signal means slow down and be prepared to stop - a requirement with which Bianchi clearly had not complied, at what is one of the most demanding corners on the calendar, taken at more than 100mph even in the wet. He had slowed a little but, as race director Charlie Whiting said a week after the crash, "it's a matter of degree". But that is not to say Bianchi was doing anything out of the ordinary. It is in the nature of F1 for people to push things to the limit, whether it be drivers or teams. It was normal practice for a driver to slow down in such situations only enough for them to have showed they had slowed down should they be questioned later. There was no definition of how much they should do so. It was behaviour that had become acceptable, in that it passed without comment from officials. In hindsight, that was a mistake - hence the introduction of the 'virtual safety car' for next season. The VSC will take such decisions out of a the drivers' hands and include systems in the car to slow it down to a specified speed in such situations. Should the safety car have been deployed? According to what had become normal and accepted practice, no. As the report put it, race officials behaved in a manner "consistent with the regulations and their interpretation following 384 incidents in the preceding eight years". In a situation where a car had gone off the track but could be recovered in a relatively short period of time, a double waved yellow at the scene of the incident was considered sufficient. It should be remembered that less than two minutes had elapsed between Adrian Sutil's crash and Bianchi's on the very next lap - the two had been racing against each other at the time - and in that period the tractor vehicle that Bianchi hit had picked up Sutil's Sauber and had almost made it behind the barrier again. Had Bianchi gone off just a few seconds later, he would have hit only the barrier. What was the crane doing there? In hindsight, it seems a terrible idea for a recovery crane that weighed 6.5 tonnes to be on the track side of the barriers during a wet race on a fast corner with cars at close to racing speeds. Looking back, no-one would disagree with that. But the fact is that despite Martin Brundle narrowly missing such a vehicle in a similar incident at Suzuka 20 years ago, few people thought anything of this until after Bianchi's crash. Now, though, this point has been accepted. And when cranes are required, the new virtual safety car will be put into action. In the aftermath of the Bianchi accident, there were suggestions that two things might have helped: some form of skirting around the crane to prevent cars submerging beneath them; or forward head protection on the cars, which has been the subject of research in recent years. But the report concluded: "It is not feasible to mitigate the injuries Bianchi suffered by either enclosing the driver's cockpit, or fitting skirts to the crane. "Neither approach is practical due to the very large forces involved in the accident between a 700kg car striking a 6500kg crane at a speed of 126kph. "There is simply insufficient impact structure on a F1 car to absorb the energy of such an impact without either destroying the driver's survival cell, or generating non-survivable decelerations." Given that the rear roll-bar structure, designed to protect the driver's head in the event of the car landing upside down, was destroyed in the accident, it is hard to argue with this conclusion. Was the car legal and safe? The report mentions that Bianchi was pressing both brake and accelerator as the car was leaving the track and crossing the run-off area. What is supposed to happen in such situations is that the fail-safe system over-rides the throttle and cuts the engine. 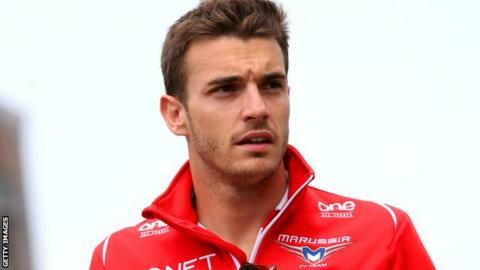 This did not happen in Bianchi's car, the report says, because of a clash with the settings of the brake-by-wire system. But the report makes it clear that the panel found it impossible to establish whether this had any material effect on the speed of Bianchi's impact. The detail of this situation - and what is behind the report - is where many people not conversant with F1 technology may get a bit lost. Brake-by-wire systems were introduced this season as a result of the complexities of the new hybrid engines. Part of the energy required for the hybrid systems to work comes from the rear brakes, and the complexities of this process mean that conventional hydraulic braking systems can no longer be used on the rear axle. The systems require electronically controlled rear brakes, whereby there is no physical connection between the brake pedal and the brakes themselves. Instead, computers interpret how the driver presses the brake pedal as a demand for a specific amount of braking. Electronics then work out how best to split that demand between the brakes themselves and the systems recovering kinetic energy from the rear axle. The fail-safe system is part of the standard electronic control unit supplied to the teams by the FIA, but how its parameters are set is down to the teams. And this is an immensely complicated area because the ability to operate brake and throttle at the same time is an integral part of how drivers control the car on corner entry - in many ways, it defines how fast they can go. In short, just because the fail-safe system did not work in these specific circumstances does not mean Marussia did anything wrong, or broke any rules - and the report's authors were careful to avoid saying that it did. However, as a result of lessons learned from the Bianchi crash, the FIA is for next year to define more specific boundaries on the amount the teams can alter these parameters. What was the biggest single cause of the accident? The report was compiled by a highly expert group including former Mercedes and Ferrari team bosses Ross Brawn and Stefano Domenicali and two respected ex-F1 drivers. It is clear that they felt there was no single cause. Instead, the report says Bianchi's terrible injuries are the result of an unfortunate set of circumstances, including the difficult conditions, the speed he was going and the presence of a recovery vehicle on track. What other changes were announced? The ratification of the decision to drop the controversial award of double points at the final race of the season was expected. But it lost its headline-making impact because of two other key decisions - the introduction of a minimum age for F1 drivers for 2016 and the surprise return of the Korean Grand Prix, albeit unconfirmed and the extension of the calendar to 21 races. Cynics will look at the delay in the introduction of a minimum age until 2016 and smile - because next year Max Verstappen is to make his F1 debut with Toro Rosso at the age of 17. So by the time the rule comes in, the Dutchman will comply, which he would not do next year. It is Verstappen's promotion that has led to this rule being introduced, if not the Dutchman himself. The teenager is clearly very talented - although it remains unknown whether he is actually ready for F1. But there has been concern about a number of aspects of his promotion - specifically whether anyone of that age has the maturity to handle the world's most demanding motorsport; and also about what it says about F1 itself that a kid who could not drive himself on the road to race meetings this season could be signed to take part in them next. Given that Red Bull had promoted Verstappen when there was no rule forbidding it, the FIA could hardly apply that rule in retrospect. So they have applied it at the soonest possible opportunity. Will there be a Korean Grand Prix in 2015? Years of experience in F1 teach one to expect the unexpected, but it seems pretty safe in this case to say that the return of the unloved race in Mokpo is highly unlikely. Its addition to the calendar on Wednesday caught the teams by surprise, but they were quick to point out that its date - just a week before the Spanish Grand Prix, producing some almost impossible logistics - meant something must be up. Insiders say the explanation is simple. Next year, the rules say that the number of engines drivers can use in a season is to be cut from five to four. But that presupposes there are no more than 20 races. The rules say each driver will be allowed five engines "if the number of events in the championship, as originally scheduled, exceeds 20". The key phrase being "as originally scheduled". The calendar announced on Wednesday is the "confirmed" schedule. Yet one of the 21 races on it - Korea - is "to be confirmed". So, now the Korean Grand Prix is on the calendar, teams can use five engines again in 2015. And that does not change even if the race drops off at a later date. Meanwhile, at least one engine manufacturer has been pushing to keep the limit on engines at five for next season, because of the complexity of the engines, reliability problems suffered in 2014 and the need of Mercedes' rivals to push development to try to close the gap to the new world champions. Putting a fantasy race on the calendar, that no-one believes will happen, only to withdraw it at a later date is a painless way of ensuring this happens without the usual arguments over rules, a cynic would say. Knowing all that, do you think there will be a Korean Grand Prix next year?